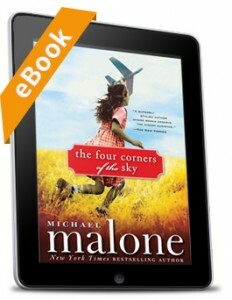 Are you reading Four Corners of the Sky? During The Big Library Read, we will post discussion questions on Facebook and Twitter, so be sure to follow us and Michael Malone and be a part of the dialogue. In addition, there will be a worldwide conversation using the hashtag #BigLibraryRead, so tweet your thoughts often on Twitter. The book’s publisher, Sourcebooks and OverDrive, will be hosting a live Facebook chat with author Michael Malone, on Thursday, May 23 at 8pm ET enabling readers to have their questions answered in real time. If you would like to participate in this chat, please send questions during the week to us on Twitter (@OverDriveLibs) and stay tuned for more information. This program is the first of its kind, so head to our eMedia Catalog to check out the title and join the #BigLibraryRead conversation! This entry was posted in Adults, Books Online, Grade Level: High School, Just for Fun, Reading, Recommended eBooks & eAudio Books and tagged Big Library Read, ebooks, The Four Corners of the Sky: A Novel by Chris. Bookmark the permalink.